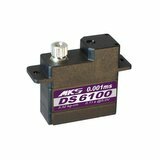 The MKS HV6110 is a high voltage version of the acclaimed DS6100 with lugs suitable for mounting as a wing servo. It is specially optimised for glider fliers, with excellent torque and precision, and a very low deadband. On a 2S LiPo battery it has higher torque and speed than the DS6100. 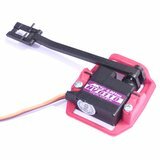 It is a very high torque thin 10g servo suitable for many wing and fuselage applications. 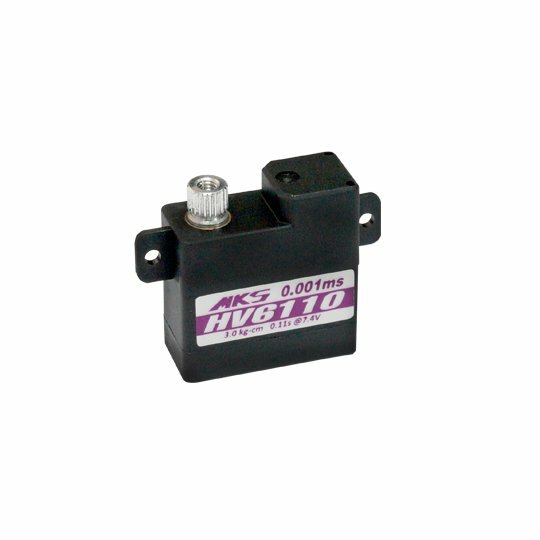 It has more torque and a better geartrain than all other high voltage servos of this size and price range. At only 10mm thick this superb wing-servo can easily fit in thin wings, but with a low height of 23.5mm it can also fit in DLG and other small fuselages. 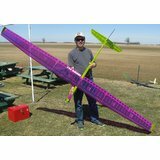 With good 3.4 kg.cm torque and a blistering 0.10s/60° speed it is excellent for flaps, ailerons, elevator and rudder on many high performance gliders, DLGs, electric gliders, and faster sport slopers. 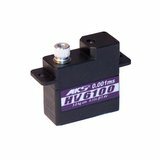 We're pleased you would like to review MKS HV6110 Servo - 10mm 10g 3.4Kg.cm. Excellent servo that I use on the aileron of most F5J gliders as well on the flap of the lighter el nino. 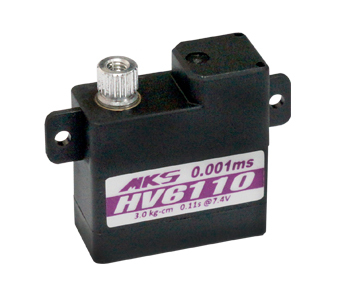 This MKS (6110) servo is still an excellent product: HV, powerful, fast, and lightweight. All i got from Hyperflight is exactly as described, and Neil is easy to discus with and answer questions as well. I purchased couple of this during years. Last order was only 2 pieces MKS HV6110 Servos and 2 MKS HV6100 Servos. MKS HV6110, one of them started when I was doing my settings rotating in only one direction all the time, not sure what is wrong, electronics looks intact, potentiometer is working fine(measured by multimeter), probably uC inside is dead. I was satisfied at the beginning with MKS quality, not it looks like they have problem. I am now afraid not to happen something inside my F5J planes during flight. I will reconsider next servos. I use the MKS HV6110 with LDS frame as the new standard for my thermal sniffers. 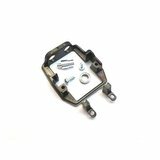 By setting the Jeti-receivers particular servo Y2 and Y3 gain to 125% for flap (butterfly) via the "jetibox", the servo movement allows for parallel servo-horn with LDS-rod in full down-flap position as well as allowing approx. 135degree travel to neutral position with net result a rock-solid-reliable very stiff lightweight setup. Great Servos! Nice centering and torque, no slop in gear. My new standart for f3j and f5j! I can't help but be impressed by the products and service provided by Neil and his team. I live in Western Australia ( i know lucky me) but the one thing missing is a good hobby shop catering for the gliding enthusiast. I am so glad i discovered Hyperflight as the service and product range is brilliant. My latest purchase arrived in good time and i just love these servos. Safely received six of these servos here in Australia. Wonderful product and wonderful service from Neil. Shipping and handling was prompt, with excellent packaging of the servos, apart from a delay through customs at the Sydney end but I can live with that to ensure that I get what I need at an economic price. Many thanks to Hyperflight UK. These are the gold standard for sub 10 gram wing servos. Great centering and torque make these a bargin for the price !